Going from her top weight of 300 pounds at the age of twenty, Mitchell takes a journey through weight loss that rids her of over one hundred pounds. Finally, after being unhappy and feeling unloved much of her life, she puts her nose to the grindstone and makes it happen. Mitchell deals with her father’s loss of jobs and alcoholism by eating. Meanwhile, we watch her mother go from being a martyr to being someone her daughter does not even like. I could not relate to the mother in this story. My own father suffered from alcoholism. My mother realized early on that she could not “fix” my father. And off we went to make a better life for ourselves. Mitchell’s mother took way more abuse than I believe anyone should have to deal with. But that is only my opinion. IT WAS ME ALL ALONG, really grabbed my attention once the story moved to Italy. That’s more than halfway through the book. I do applaud the author for her honesty. And I applaud her amazing weight loss which was not easy nor a quick fix. She’s been able to keep it off over six years now. Kudos to you, Andie! My finished hard copy of IT WAS ME ALL ALONG, by Andie Mitchell, came to me from Blogging For Books in exchange for an honest review. Thanks so much! I have been following her blog for a long time and she often shared her writing routine with us. I really appreciate that it wasn’t an easy loss for her. 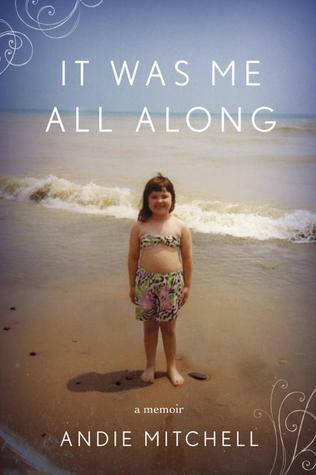 Right before her book came out, she gained some weight back but was so honest about it on her blog. How can you not love her? I liked her book quite a bit. Her blog talked about her struggle with weight but never really touched on her relationship with her dad.